Not to be confused with Norwich, Connecticut or Norfolk, Connecticut. 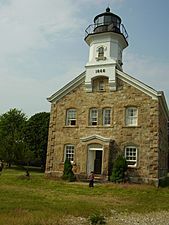 Norwalk (pronounced nôr′wôk′), is a city in Fairfield County, Connecticut, United States, located in the New York metropolitan area. The estimated population of the city was 88,485 in 2015. Norwalk is the sixth most populous municipality in Connecticut. 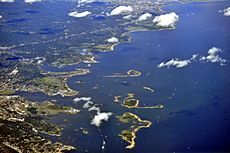 "Norwalk, settled 1649; incorporated Sept., 1651, Norwaukee shall bee a townee Algonkin noyank, point of land, or more probably from the Indian name, Naramauke." In 2002 Norwalk was the location of the nationally-covered murder trial of Michael Skakel. After a four-week trial, Skakel was convicted on June 7 for the 1975 murder of Martha Moxley. On Sunday May 25, 2008 the last service at the First United Methodist Church of Norwalk was held prior to a deconsecration ceremony that marked the end of the church use of the distinctive yellow brick building at 39 West Avenue. The Methodist congregation had been formed in 1789 during the visit by Jesse Lee, but is survived by three other Methodist churches in the city. According to the United States Census Bureau, the city has a total area of 36.3 square miles (94 km2), of which, 22.8 square miles (59 km2) of it is land and 13.5 square miles (35 km2) of it (37.24%) is water. "Norwalk, Connecticut, gets 45 inches of rain per year. The US average is 37. Snowfall is 24 inches. The average US city gets 25 inches of snow per year. The number of days with any measurable precipitation is 100. On average, there are 179 sunny days per year in Norwalk, Connecticut. The July high is around 83 degrees. The January low is 18." 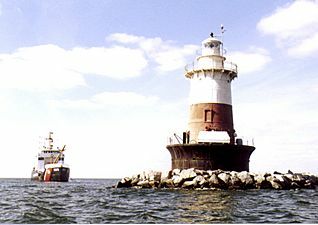 Norwalk's topography is dominated by its coastline along Long Island Sound, the Norwalk River and its eastern and western banks, and the Norwalk Islands. 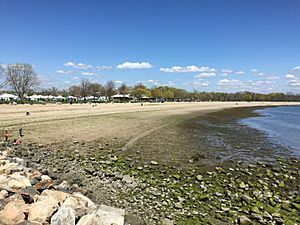 The highest elevation is 282 feet above sea level, at the summit of Middle Clapboard Hill in West Norwalk; and the low elevation is sea level on Long Island Sound. According to the office of Connecticut's Secretary of the State 85,603 people resided in Norwalk in 2010. A population estimation indicates 88,485 people resided in Norwalk as of 2015, an approximate population growth of one percent. The estimate indicates a racially diverse population of 42,768 males (49%) and 44,446 females (51%). The racial makeup of Norwalk was 55.7% White, 13.4% Black, 0.1% Native American, 4.7% Asian, 0.0% Pacific Islander, 0.3 from some other race and 1.4% from two or more races. 24.3% were Hispanic or Latino of any race. The city of Norwalk exists by authority of a municipal charter, granted by the Connecticut General Assembly, which is the legal document that defines the organization, powers, functions, and essential procedures of the city government. Norwalk's municipal government is a Weak-mayor form of a Mayor-Council government with the mayor of Norwalk elected by its voters. The city's charter gives certain administrative powers exclusively to the Council and others jointly to the Council and Mayor. The Common Council is the law-writing body of the City of Norwalk. Norwalk's common council consists of fifteen council members, five elected at-large and ten elected by district, two from each district. Administration offices are located at 125 East Avenue in Norwalk City Hall. Norwalk is represented in the Connecticut General Assembly by five House Representatives corresponding to five Connecticut legislative districts and one senator from one Connecticut Senate district. 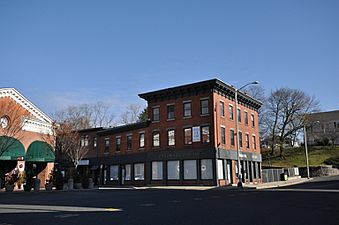 Norwalk, which lies within Connecticut's 4th congressional district is represented in the United States Congress by one congressional representative in the United States House of Representatives and, along with the rest of Connecticut, by two Senators in the United States Senate. St. George Greek Orthodox Festival, held in late August, the festival features Greek delicacies, Pontic Greek dance exhibitions and a large carnival. Round Hill Highland Games, a festival of Scottish culture and athletic events, was started in 1923 in Greenwich, CT but interrupted during World War II, then restarted in 1952, and has been held in Norwalk's Cranbury Park on or around July 4 for a number of years. In 2006, the 83rd annual event attracted 4,000 people to hear bagpipes and watch the caber toss, the hammer throw, and other events; with athletes often wearing wool kilts. Games for children are also offered. Food and Scottish items are offered for sale. Organizers say the event is the third-oldest Scottish games festival in the United States. Baseball and softball are popular amateur sports with active leagues across many age groups in Norwalk. There are 4 baseball fields and 16 Little League fields in the city. Several of the fields are illuminated for nighttime play. The Norwalk Little League team won the Little League World Series in 1952. The 14-year-old Babe Ruth League team won the championship in 2008. In 2010, the cal Ripken 12-year-old Norwalk all star team made to the Cal Ripken league World Series and placed 3rd in the country. In 2011, the Norwalk American Senior Legion baseball team won the Connecticut State Championship. This had not been accomplished by any other Norwalk Legion team in the storied 83-year history. The team defeated Branford, CT in the championship game. The girls Norwalk Pride fast pitch softball team won the Connecticut State Championship in 2005, 2006, and 2007. The Norwalk Biddy Basketball All Star team Won the State and Regional titles and then went on to the World Championships in New Orleans, LA in 1986 and placed 7th in the world. Being a coastal city Norwalk is home to a great many water sports including competitive swimming, recreational boating and fishing, sailing, windsurfing, and kayaking. The Norwalk River and inner Norwalk Harbor host rowing events and organizations. Norwalk resident Daniel Walsh won a bronze medal in Beijing with the U.S. Olympic rowing team in the 2008 Summer Olympics. There are three golf courses in the city of Norwalk. The cross town rivalry between the city's two largest high schools' sports teams can be rather fierce, particularly for the football, soccer and field hockey teams in the fall; as well as lacrosse, baseball, and softball teams in the spring. Brien McMahon high school's football team won the FCIAC (Fairfield County InterAthletic Conference) and Class M State Football championship in 1994. McMahon high school's boys lacrosse team went on to win the state division 2 lacrosse championship in 2000. In professional team sports, Norwalk is represented by the Connecticut Wildcats in the American National Rugby League. In J. D. Salinger's novel, The Catcher in the Rye, Holden's parents are attending a party in Norwalk the night he sneaks into his apartment to visit his sister, Phoebe. In Jonathan Franzen's novel, The Corrections, Chip Lambert holds a "twelve-hour vigil" at a Dunkin' Donuts in Norwalk (stalking Melissa Paquette in neighboring Westport). In the 20th-Century-Fox film noir classic Laura, Gene Tierney as Laura Hunt says: "Then I got off the train at Norwalk"
Confessions of a Shopaholic (2009). — filmed along Washington Street in SoNo. Birds of America (film) (2008). College Road Trip (2008). 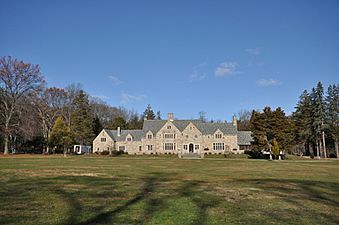 — scenes filmed in town in mid-July 2007; shooting locations were the former Norwalk police headquarters building in Matthews Park, on the Merritt Parkway and along the Route 7 connector. The Six Wives of Henry LeFay (2008). - Filmed in 2007 on Wall Street in Norwalk Center. The Life Before Her Eyes (2007). Uma Thurman filmed a scene at Norwalk Community College in August, 2006. For One More Day (television movie, ABC, December 2007). — filmed in July 2007 on Broad Street. To All My Friends On Shore (1972, made-for-TV movie). House of Dark Shadows (1970, TV series). — "Abandoned Monastery" portions filmed at the Lockwood-Mathews Mansion. A Wheels bus at Wheels hub. Norwalk, Connecticut Facts for Kids. Kiddle Encyclopedia.